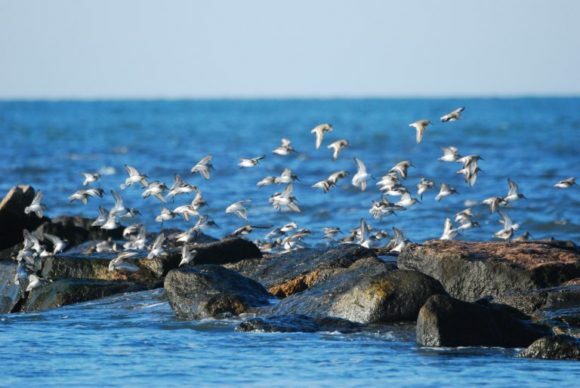 This Saturday, Jan. 13, learn about the birds that overwinter here in Southeastern Connecticut while on a hike in Old Lyme led by CT Audubon. Photo by Amelia Graham. Join one of the Roger Tory Peterson Estuary Center’s teacher-naturalists every Saturday in January at 9 a.m. for fresh morning air and a naturalist lesson as the group hikes in a different location each week. These hikes are free to Connecticut Audubon members; $5 non-members. Saturday, January 20, 9 a.m. This walk will focus on natural cleaners of nature, we will discuss carbon sinks, decomposers, and natural filters like shellfish, moss, mushrooms, estuaries and more. Led by Morgan Allen. Saturday, January 27, 9 a.m.
Connecticut has its fair share of salt marshes. They are both beautiful and crucial to many animals. Learn about why these habitats are important to a wide range of species. Led by Joe Attwater. To register for any of the walks or for more information, visit this link.